if by any chance you decide to use single precision in ode, make sure to uncheck the USE_ODE_DOUBLE flag. The iCubSimulator uses the ResourceFinder to read configuration parameters from a file placed in a directory called simConfig in $ICUB_ROOT/app. This makes changing the parameters used by the module by switching its "initialization context" much easier. The iCubSimulator looks for all the configuration parameters in a file called simulator.ini which sets up all the required parameters accordingly. By default the parameters are in $ICUB_ROOT/app/simConfig therefore by running run iCub_SIM from the source directory, it will pick up all the default configuration files. If the users would like to run the simulator with their own configuration files, we have to tell the module (the ResourceFinder) where to look for the file ‘simulator.ini’. We do this by specifying the initialization context, that is the name of the directory that should be used to locate the file ‘simulator.ini'. Make sure you select the parts you would like to use otherwise they will not respond. It is also recommended to turn off the parts not required to save computational effort. On linux, you'll need to be careful not to put windows over the simulator window - otherwise the output on the camera ports will be random in those areas :-). Please set the desired iCub parts activation before running. Manual navigation in the environment is possible. Use keys w,a,s,d and mouse for rotating. A user can see the commands that the "rpc:i" port supports by using "yarp rpc" to send it the message "help". will command axis 0 of the left_arm (Shoulder pitch) to 45 degrees. Note, there is a simple short-cut to make the robot go to its home position. Just press 'H' while the window is active. eg: "yarp connect /icubSim/cam/left /example"
If you want to change the FOVY, then you also have to change fx and fy accordingly. "world set box x y z"  eg: "world set ball 1.0 0.1 2.0"
Objects are placed in the <world> reference frame, placed on the floor, between the legs of the robot as in the picture (y axis pointing above, x towards the left of the robot and z towards the front). Notice that the robot kinematics (Cartesian interface) uses the <robot> reference frame. Note that this rototranslation applies as long as the 'elevation' flag in the simulator configuration file is set to off. Otherwise, the robot is lifted, changing the position of the root reference frame w.r.t. the world reference frame. It is possible to create boxes, spheres and cylinders in the world. It is also possible to specify if the actual object can collide with the robot. This is an extra boolean parameter while creating the object. By default the collision is on and can be removed only if specified by the user. 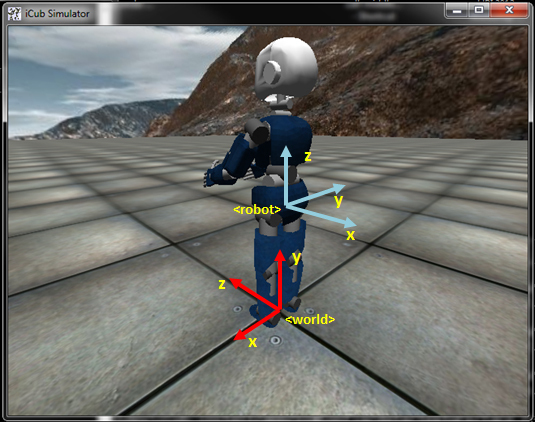 This sections describes how to add 3D models with their textures into the iCub Simulator. In order to easily import 3D objects created in a modelling package (such as Blender, 3DS Max, Milkshape, Maya, etc.) we use the .x (Directx) file format. Open Blender and create your 3D model, if you are a novice please look at documentations and tutorial available freely in the web. Select the model and go to Edit Mode -> click on Mesh -> UV unwrap -> unwrap. This is to unwrap the model in order to attach a texture. Go to the UV/Image editor, click on image and open. Browse for your texture image (bmp format) and load it. At this stage you can do any modifications to the texture as desired. Again if you are not familiar with how to do this please look at documentations and tutorial available freely in the web. Return to the 3D View, and press "Ctrl+ t". This will convert the model into triangles for easy import into the simulator. Return to Object mode, click on file -> export -> Directx (.x) make sure that you are using the right handed system by clicking on "flip z" and then export to the desired location. Here are the new commands for importing and manipulate your newly created 3D models. These commands are also valid for the static model (smodel). In the standard regime, iCub's body parts can collide only with external objects. In addition, the plastic covers (meshes) are exempted from collision detection. It is also recommended to have ODE compiled with the --enable-libccd option on (see http://eris.liralab.it/wiki/ICub_Simulator_Installation), which is necessary for cylinder-cylinder collisions support (for example, all iCub simulator fingers are cylinders). The self-collisions are implemented by dividing the iCub's body into several collision spaces (normally, the whole robot is one space and thus its parts are not checked for self-collisions). With "self-collisions on", the collision spaces are: head, torso, left arm, right arm, legs. Thus, internally, during collision detection in ODE, the bodies composing say the left arm space are checked against the bodies composing the other spaces. At the same time, no collisions are checked for within a space. This means that currently the two legs would not collide with each other, for example. If covers_collisions are on, that means that the plastic covers will become proper collision bodies like the other bodies composing the robot. They will thus be checked for collisions with external objects, and - if "self-collisions on" - they will be part of respective subspaces of the robot and can thus collide with other subspaces. This is the original implementation. Corresponds to the "whole_body_skin_emul off" option under [SENSORS] in iCub_parts_activation.ini. 6 touch sensors have been added on each of the hands and are now compatible with the physical iCub and can be used with the iCubSkinGui These are boolean (1 or 0) if the "pressure off" option is chosen, or pressure sensors ("pressure on"). The convention used in the compensated tactile ports of the real robot is used - higher values correspond to higher pressure. the palms (skin version 2.1, without triangles); it is split into 5 subregions that selectively light up depending on the contact coordinates. This emulation relies on retrieving the contact coordinates and then comparing those with the position of the taxels in the real robot. It is thus subject to inaccuracies in the kinematics of the simulator vs. the real robot and in skin calibration of the real robot. In addition, skin_events port is emulated. This is implemented as follows: For each contact joint created by ODE, a skinContact / skinEvent, is created and sent to the port. See also Tactile sensors wiki) - "High level contact data" for the details of the format. The coordinates of the contact are transformed from the simulator world coordinates to coordinates of the respective link to match the conventions on the real robot. The skinContactList can hence be visualized using the iCubGui. The force value and direction is set based on the contact feedback structure from ODE, but is not necessarily very meaningful (esp. the value) - this was reported in the ODE mailing list. For skin parts that have a higher resolution emulation implemented, the taxel IDs is a list of activated taxels. Otherwise, the taxel id is a FAKE_TAXEL_ID, currently set to 10000. Note also that the skinEvents are generated for any bodies experiencing contact, that is not only those containing skin in the real robot (covers). Note, for skin emulation to work properly (including skin_events and higher resolution for indiv. skin parts), the iCub [PARTS] in iCub_parts_activation.ini need to be enabled. More specifically, for the upper body skin emulation that is currently implemented, head, torso, left and right arm need to be "ON". In the iCub_parts_activation.ini file, there is a flag to switch to the pressure sensors. This is part of the original "Touch sensors on fingertips only" implementation, where an "off" setting results in boolean values, where "on" retrieves the pressure values from ODE. In the "Whole-body skin emulation" mode, the flag has no effect. The values in the emulated compensated tactile ports are either 255 (when active) or 0 (when inactive). Actual pressure values as obtained from ODE are available in the skin_events structure. Roll and Pitch are similar to the robot. Yaw is the actual yaw angle whilst the inertial sensor on the robot calculates it with respect to the magnetic field. The magnetic fields are not calculated. The simulator just sends 0.0 instead. PS: this is just a quick way to move things around without using the hand. It only works when the hand is NOT activated and it creates a fixed joint between the hand selected and the object. It will not move any fingers...just lift the arm to see the object move with it. Face expressions can now be used with the simulator. There are two ways of running the face expressions on the simulator. One is sending raw commands directly to the faceExpression module or using the emotionInterface (a more human readable way) that is currently being used by the real robot. The above commands in the brackets will set iCub's mood to sort of happy. Only one command is send at a time. The first letter in the command specifies the subsystem and the rest is hexadecimal number, which is then decoded to 8 bits binary number. For example L followed by 02 sends this binary number (0000 0010) to the left eyebrow subsystem, which activates 2nd port. In similar way, L followed by 04 would activated 3rd port of the left eyebrow subsystem as the binary number for hex 02 is (0000 0100). What happens here is we set up a yarp "port" name for each texture in the simulator that you want to control via a stream. At this stage you can send web cam streams or video sequences directly to the port /icubSim/texture and it will be displayed as a texture on an object. Where NN1 and NN2 are the indices of the surfaces you want to project onto. This page was last edited on 2 May 2017, at 18:31.